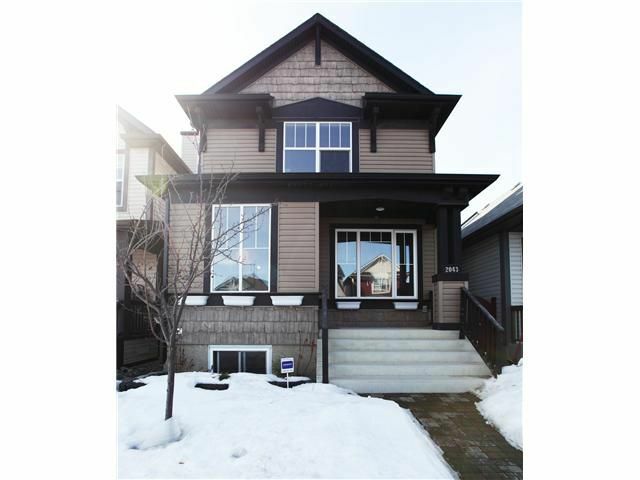 Stunning 2 storey home in the award winning community of New Brighton. This 1474 sq'ft. home built by Heartland in 2006 (Belvedere) is a must to view! Loaded with upgrades and in a fantastic location just down the street from a lovely park. The main level features espresso stained hardwood floors, great room with 9' ceilings, half bath with tiled floors, gourmet kitchen perfect for entertaining! Your family and friends will love it!! Upgraded black appliances, extended height cabinets stained maple toffee, cathedral ceiling, huge central island/breakfast bar, pots/pans drawers, pantry, tiled backsplash and a large dining area. The upper level has 2 large bedrooms both with ensuites, a large loft area, upgraded berber carpet and underlay and upgraded maple railings. Some other features included are vacuflow throughout, built in ceiling speakers and 9' ceiling in the basement. The WEST FACING backyard features a huge 19x14 ft deck, perfect for enjoying the sunset! Call your favorite Realtor to view! !